Let's harness the excitement, the 2014 World Percheron Congress is 378 days away! Your World Percheron Congress Committee is hard at work planning another fantastic event. We are grateful for all of our sponsors and STABLEmates! Without each and every one of you we would not be able to put on this celebration of the Percheron horse. There are still classes available to be sponsored. If you are interested in sponsoring a class please contact Jane Gray, jgray@2014worldpercheroncongress.com. Have you picked up your Drive 4 The Cure merchandise yet? 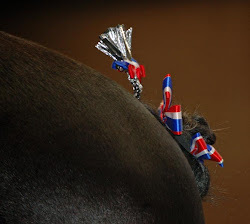 In honor of Breast Cancer Awareness, Five Star Horse Decorations is donating a white Mane Roll, 5 Rosettes and a Tail Bow for each entry in the "Drive 4 The Cure" charity Open Cart Class at the 2014 World Percheron Congress! We are in search of the next World Percheron Congress America Queen and the World Percheron Congress America Ambassador! Do you know a young lady or gentleman that would be interested in serving as either the Queen or Ambassador of the 2014 World Percheron Congress? More information can be found on the web site. Stay up to date with the latest happenings on our Facebook page! Hi! Hope you don’t mind me dropping a link to my Legal news site, thought it related to your work here. Great posts!